In this sixth grade science class, students will begin to understand the process of decomposition and learn about the organisms responsible for breaking down matter. Students will also begin to make the connection with finished compost as food for plants in the garden. "Help us with this mystery. What is going on with this apple? It’s not looking so good…"
Have students participate in a Think-Pair-Share and discuss what they think is going on with the apple. Ask for two or three people to share out their thoughts. If possible, have the students build on the ideas of others in the conversation. Explain that students will take a break from their working groups to visit the Compost Lab. Explain that the garden can be thought of as an outdoor laboratory – a place to experiment and figure things out together. Go over the garden jobs and divide students into working groups. Focus attention on the Job Board and exhibit team teaching. From their seat in the circle, each garden teacher gives a brief description of the garden job they will be leading that day. In your small group, ask students to share one question they have about decomposition before participating in the lab. Students rotate through the Compost Lab activity and their working groups. Come back together as a group and have the students do a Think-Pair-Share discussing how what they found is connected to the decomposition of the apple. Once they have finished sharing with each other, ask several students to share out with the group what connections they or their partner have made during their discussion. Show students the Compost Cake visual aid. Explain that building a compost pile is similar to building a layer cake. This layer cake/compost pile is feeding the FBI. Show students the Compost Cake ingredient cards, and invite them to identify each one as they are arranged on the visual aid: C is for carbon (sticks, straw, dry material, “the browns”), N is for nitrogen (living plant matter like leaves and grasses, “the greens”), M is for manure (horse, duck, chicken manure, which are rich in microorganisms), N is for nitrogen (this time from food scraps). Explain that decomposers, like all living organisms, have three main needs for survival: food, water, air. When building our compost piles, we are creating an environment suitable for the FBI by providing food, water, and air. Open the “Top Secret” file folder and have students identify the FBI while looking at images of each. Have students review what elements are found in the staged piles of food scraps, browns, and greens (carbon and nitrogen). Explain that we layer the browns, greens, and food scraps to make our compost piles. Have students gather around the hottest (newest) compost pile. Direct their attention to the thermometer in the compost pile. 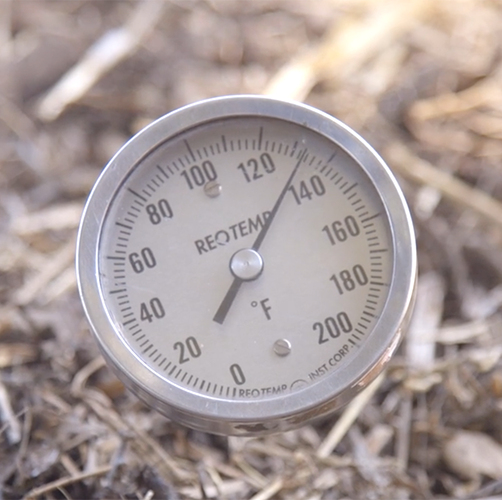 Take guesses from students on how hot the compost pile gets and why it heats up. Have students read the thermometer and explain that decomposition is happening fastest when the compost is at the ideal temperature of 130-160 degrees Fahrenheit. Take guesses for what causes the heat. Draw an analogy between a middle school dance – with a hundred students moving around in one room – and the bacteria in the compost pile. Individually, we hardly notice our own body heat, but when we are all together – eating, digesting, and moving around – our heat is noticeable and the room heats up. Explain that the billions of active bacteria give off heat while they decompose the pile. Show students the progression of the compost piles from start to finish with a walk down the row. Ask students to make an observation about the difference between the first and the last pile (e.g. looks like soil, no longer hot, can no longer recognize the parent material, smaller in volume). After showing all the stages of decomposition, gather students around a bucket of sifted finished compost. Invite students to hold finished compost in their own hands. Explain that the components of this pile have been decomposed and changed into living soil. Take a handful of soil and explain that there are billions of bacteria in each handful. Prompt students to think about why we might build compost piles in the garden when decomposition is occurring all around us all the time. Explain to students that composting speeds up decomposition, reduces waste, and replenishes soil. Ask students to now come up with a working definition of decomposition together. Have a student read aloud the dictionary definition of decomposition and notice how the two are similar. Ask students to think about one question they have about compost. Facilitate a Think-Pair-Share discussing a question they have about compost. Share out. At the Edible Schoolyard Berkeley, our compost pile is called "Compost Row." Compost Row is a free-standing pile method consisting of layered browns and greens. Science students at King add air to the compost by turning the piles across compost row until they have fully decomposed into living soil. Students learn that the process of decomposition helps reduce waste and replenishes soil by amending the soil with finished compost. The concept of soil fertility is discussed. Students are given the opportunity to learn that topsoil is alive and is a habitat for many organisms. Healthy soil translates to healthy plants and healthy plants translate to healthy humans and animals. The concept of Matter Cycles is used to drive home this point. The nuts-and-bolts skill of how to build a compost pile is valuable for students to know in our collective effort to maintain the garden space. Throughout the year, students can reference the compost lab when they are working on composting to bring meaning to the work. Identify layers and components of a compost pile; observe fungus, bacteria, and invertebrates in decomposition; tend compost with guidance.